There is a Para Kundalini Yakshini named in one of the Yakshini Tantras, however, I have not discovered the exact attributes of this Yakshini. 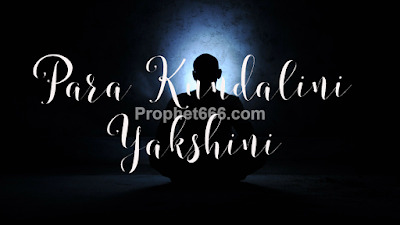 However, as the name suggests, this Yakshini and her Invocation Mantra is probably connected to Kundalini Awakening and some fearsome Tantric Rituals connected to the stimulation and raising of the Kundalini Shakti. The Mantra Chanting has to be done in a Samshan Bhoomi and the Sadhak has to chant the Mantra given below 10,000 time daily, until the Yakshini is finally invoked. The exact nature, attributes and appearance of this Yakshini is not available anywhere and the fruits or rewards of performing this Yakshini Sadhana is also unknown. Apart from the Mantra Chanting. There is no information available about any rituals that might be possibly a part of the Mantra Sadhana. As mentioned in earlier posts, Yakshini Sadhana is not for everyone and even if you are an advanced Sadhak, one mistake and you might end up loosing your life or becoming a lunatic. These kinds of Mantra Sadhanas are most dangerous and can be compared to trying to sit on the edge of a sword. If any reader has knowledge about the Para Kundalini Yakshini, please share your information in the comments section or through the contact form. Anyone who has experienced success in any Yakshini, Yogini, Apasara, Yaksh, Veer Sadhana or the Sadhana of any other mystical being, including Bhoot-Pret and Pishach-Pishachini Sadhanas, kindly share your experiences for the benefit of other readers. Hi friends for raising kundalini, please come to Sahajyog, there is no tantra or any difficult procedure required. Join sahaj yog.